Congress is set to begin work on next year’s spending bills close on the heels of President Donald Trump signing the omnibus spending package, which brought fiscal year 2017 to a late close. Next, appropriators must write bills to cover government spending in FY 2018, which starts in only five months. Lawmakers already said their work will be difficult because the House has only about 50 official work days remaining before money provided by the $1.1 trillion omnibus runs out Sept. 30. After passing the omnibus package (H.R. 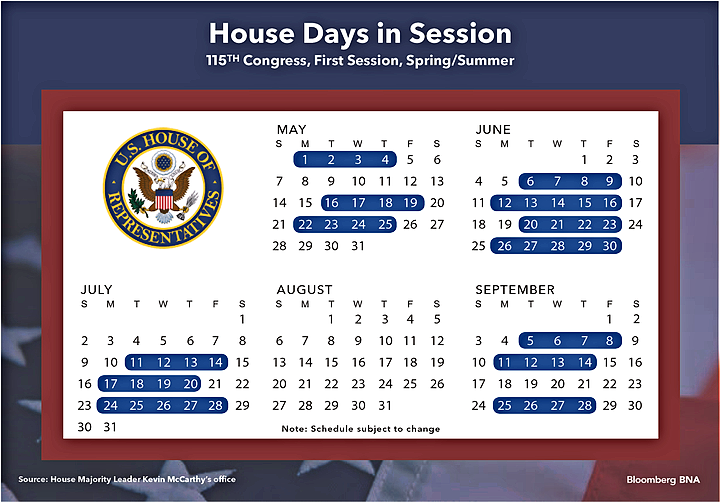 244) the House departed for a 10-day break, while the White House continues to work on the details of the 2018 budget it plans to send to Capitol Hill in late May. Hearings on next year’s budget were minimal while appropriators negotiated the omnibus, and lawmakers already are warning that this year’s process will be “truncated” as House Speaker Paul Ryan (R-Wis.) and Senate Majority Leader Mitch McConnell (R-Ky.) try to get as many of the 2018 bills to the floors of the House and Senate as possible before the August recess that begins July 28. Trump’s signature on the omnibus averted any crisis when a stopgap measure funding the government expired at midnight May 5 (See related story in this issue). But Trump’s tweets suggesting a “good shutdown” might be in the offing in September to force a new deal that he likes better signaled that appropriators could be in for a rough ride as they work to finalize next year’s bills. Republican leaders said they have no stomach for a shutdown but already sent warnings that they may need a new stopgap next fall to buy them more time to reach the finish line on the 2018 bills. “The ’18 process will be extremely difficult and truncated, and it will make work harder, and we may well find ourselves back here in a matter of months asking for some kind of brief extension,” said Rep. Tom Cole (R-Okla.), chairman of the House Appropriations Labor, Health and Human Services and Education Subcommittee. As appropriators begin their work, however, lawmakers cited some key takeaways from the recent negotiations and passage of the omnibus. The $1.1 trillion omnibus Trump signed included 11 of the 12 annual appropriations bills and were written to reflect the $1.070 discretionary spending cap plus budget law that permits extra spending via the so-called Overseas Contingency Operations account, the disaster relief category, and more. The package, which was attached to an unrelated veterans bill and also carried other authorizing legislation, mirrored those seen in the last two years when Ryan and McConnell used them to enact expiring tax provisions, cybersecurity legislation and even a repeal of the oil export ban. Both McConnell and Ryan already have said they want to enact bills through “regular order,” but the prospects for many—if any—to avoid being wrapped into a massive omnibus already appear poor. In addition, having them enacted by the Sept. 30 deadline also is now a heavy lift for Congress. Only one bill—Military Construction and Veterans Affairs—was passed as a stand-alone bill, but that was used as the lead vehicle to pull through a must-pass continuing resolution by Sept. 30 last fall. “It’s the first appropriations bill passed on time since 2009,” Milcon-VA Subcommittee Chairman Charlie Dent (R-Pa.) said. The omnibus reflected the first major legislation sent to Trump’s desk and both Republicans and Democrats said the final product of intense bipartisan negotiations could be a template for future deals, not just on the appropriations front but on the overhaul of the tax code and an infrastructure plan. Besides Ryan and McConnell, House Minority Leader Nancy Pelosi (D-Calif.), Senate Minority Leader Charles Schumer (D-N.Y.) and senior appropriators in both parties were heavily involved in the final round of talks on the omnibus. Cole and House Appropriations Committee Chairman Rodney Frelinghuysen (R-N.J.) praised the $25 billion extra for the Department of Defense in the bill but also joined Democrats in backing increases that support more National Institutes of Health research, full-year Pell Grants for college students and a permanent fix to ensure health-care benefits for retired miners. Trump’s been credited with mastering the “Art of the Deal,” but it is McConnell who is widely seen as the key lawmaker needed to make a successful deal come together on Capitol Hill, particularly on the ground he plowed as a member of the Senate Appropriations Committee. The Republican leader continues to hold on to his slot as the most senior member of the panel behind Chairman Thad Cochran (R-Miss.). McConnell has been committed to avoiding fiscal crises, particularly any replay of the 2013 government shutdown, since taking the helm as majority leader. While Ryan can’t always convince House Republicans to line up behind appropriators’ bills—such as House Freedom Caucus members—McConnell ultimately is the one who delivers the votes and the deals that fund the government. Schumer and Pelosi were widely seen as scoring major victories in the final round of talks, including being able to force Trump to forego money to start building a wall along the U.S.-Mexico border and Republicans to drop more than 160 poison pill riders. Democrats also successfully fought off Trump’s plan to slash domestic discretionary funding by $18 billion. The appearance that Democrats bested Trump in the negotiations drew fire from Office of Management and Budget Director Mick Mulvaney, who said the president came out on top with the defense increase and $1.5 billion for border security upgrades. But many Republicans said the Democratic buy-in is essential for any package to succeed. The House vote on the omnibus demonstrated the key role of the minority. The omnibus passed the House 309-118, but only 131 Republicans voted in favor while 103 GOP members opposed it. Passage depended on the votes of 178 Democrats. Only 15 Democrats voted against the package. “It takes both the minority and the majority to get it done and no appropriations bill is going to get overwhelming support without it, and that’s how you thread the needle to get a good outcome,” Sen. Jerry Moran (R-Kan.), chairman of the Senate Appropriations Military Construction and Veterans Affairs Subcommittee, told Bloomberg BNA. In asserting their power over government purse strings, appropriators and their leadership reverted to form and crafted a plan that created winners on both sides of the aisle. Agreeing to some of the items Democrats wanted wasn’t hard, particularly because Republicans also wanted them, lawmakers said. Among other things, Shelby cited the $368 million increase for the National Aeronautics and Space Administration and other increases in the C-J-S bill along with defense money as wins he also favors. Both Democrats and Republicans claimed credit for provisions in the final package that ensure continued health-care benefits for retired coal miners. The $1.38 billion provision was championed by both Sen. Joe Manchin (D-W.Va.) and McConnell. McConnell along with Rep. Hal Rogers (R-Ky.) joined Democrats in praising the $822 million in extra resources that can be used to fight the opioid crisis. Another win for the delegations of Kentucky and nearby states was record funding for the Appalachian Regional Commission, which Trump wants to “zero out” in the upcoming budget. Schumer repeatedly praised McConnell’s role in the talks and credited him and other Republicans for working steadily with Democrats to reach the final deal. But, he said, Trump won’t always get everything he wants. Future deals are likely to advance as the current package did. After being unveiled late on a weekend, the more than 1,600-page measure was quickly filed in the House in the early morning hours of May 1 and then readied for a House floor vote May 3 and a Senate floor vote May 4. The bill was at the White House well before a stopgap expired at midnight May 5. Both Ryan and McConnell resorted to “martial law” to get the omnibus quickly passed. To expedite work they attached the omnibus to a previously approved veterans bill. “Closed rule, one hour of debate, no amendments,” summed up the office of House Majority Whip Steve Scalise (R-La. ), whose home state is poised to receive another large slug of the more than $1 billion in disaster aid included in the package. Appropriators, who worked with their aides around the clock to strike the deals that headed off any threat of a crisis on Trump’s 100th day in office, were stung by the president’s tweets threatening a shutdown later this year. Trump suggested that a change in Senate rules to allow spending bills to be passed without Democratic votes could head off any need for a shutdown to force better deals, but McConnell said also he’s having none of that. “There is an overwhelming majority on a bipartisan basis not interested in changing the way the Senate operates on the legislative calendar and that will not happen,” McConnell said. Trump’s statement issued immediately after he signed the omnibus into law also signaled that the 2018 process will be difficult. The president said he probably will disregard many provisions in the new statute. Meanwhile, the White House isn’t backing away from the $54 billion in domestic program cuts it outlined in the “skinny” budget it sent to Capitol Hill in March. That budget called for cutting the budgets of the Agriculture Department 21 percent and the State Department and the Environmental Protection Agency budgets by 30 percent. Lawmakers said they expect to see large reductions in the expanded budget being sent later this month. Republicans said they may have more leverage over Democrats because the spending framework outlined by the two-year bipartisan budget agreement will expire with 2017. But they said they also are likely to ignore many of Trump’s proposals. Sen. John Hoeven (R-N.D.), chairman of the Senate Appropriations Agriculture Subcommittee, told Bloomberg BNA that Trump’s plan won’t be where appropriators end up. “His budget proposal is a starting point and then we’ll go to work on it,” Hoeven said. Trump’s shutdown remarks alerted members on both sides of the aisle that the threat of a new government shutdown remains on the table despite their best efforts to avoid it. Sen. Jeff Flake (R-Ariz.) said Republicans want “absolutely none of that” and said Congress needs to push back against those threats. But Shelby said Trump’s remarks don’t mark the first time this year he’s heard officials advocate for a shutdown. He said both sides need to work hard to avoid a replay of what happened in 2013.